Mastering electronic music is not easy. In fact, it's downright hard as hell. Getting your tracks to sound loud, punchy, rich, full and clean all at the same time can have you pulling your hair out in no-time or worse, abandoning a project altogether. In this extensive course, I'll take you through each of Ozone 7s modules and dive deep into the techniques you need to create incredible sounding masters for any electronic piece you produce. This is a tell-all course that will teach you exactly how i and other mastering engineers work to transform less than perfect mixdowns into polished masters ready for the world to enjoy. 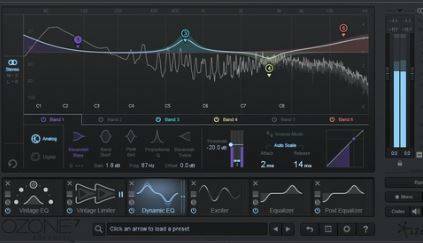 Whether you're new to Ozone or have been using it for years, this course is guaranteed to teach you something new with a fresh approach to mastering your own tracks with Ozone 7, or even other people's tracks. You also get to be in direct contact with me at any time and have lifetime access to the course once you enroll. You can ask questions, post comments and start discussions with myself and other students in the course. Whether you produce house, trance, deep house, trap or anything in between, there's something in this course for you. And don't worry if you own a different version of Ozone. you can use the techniques in this course for any previous or newer version of Izotope Ozone! So if you're looking to upgrade your knowledge of audio mastering, sharpen your mastering skills or dip your feet in the world of mastering for the first time, this course is exactly what you're looking for.